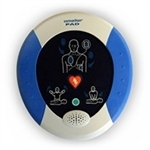 The HeartSine Samaritan PAD 300P defibrillator is a lifesaving device that is both compact and easy to use. It analyzes the heart and delivers an electrical shock when needed to someone experiencing cardiac arrest to restore the heart to a normal rhythm. 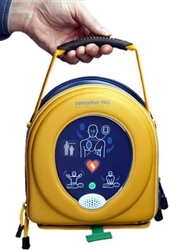 The HeartSine Samaritan AED was designed especially for use in public areas when an emergency happens, allowing anyone nearby to save the life of someone experiencing sudden cardiac arrest. To make it easy for anyone to use, the AED provides easy to understand voice commands and corresponding visuals to guide the user through the process of using the defibrillator. The defibrillator was made with simplicity in mind, featuring only 2 buttons, an on/off switch and the shock button. The HeartSine Samaritan also features a System Status Ready Indicator that flashes to show the device is ready to be used, based on the automatic weekly self-check. The HeartSine was designed to be lightweight and compact without sacrificing features or performance. The Samaritan AED weighs in at only 2.4lbs, making it lighter and smaller than most other AEDs. It features a durable design that resists shock and vibration and carries an IP56 rating, the highest level of protection against dust and moisture. HeartSine stands behind their products offering a 10 year warrantee on their Samaritan automatic external defibrillators. HeartSmart carries the HeartSine Samaritan AED, parts and accessories, and other automatic external defibrillators from top brands including Zoll AEDs, Philips AEDs and more. If you are looking to place an AED in a school, business, or any other location, but have budget limitations, we also carry re-certified HeartSine Samaritan 300P AEDs. Re-certified AEDs are all tested and certified to meet the same standards of a brand new device.